At the time of his death in 2006, Harry Seidler was Australia’s best-known architect. The Sydney Morning Herald carried a banner headline “HOW HE DEFINED SYDNEY” and there were obituaries in the London and the New York Times. Lord Richard Rogers, of Paris Pompidou Center fame, describes him as one of the world’s great mainstream modernists. This film charts the life and career of Harry Seidler through the eyes of those that knew him best; his wife of almost fifty years Penelope Seidler; his co-workers including Colin Griffiths and Peter Hirst who were by his side over four decades; and several well-placed architectural commentators and experts including three laureates of the highest honour the world architectural community bestows, the Pritzker Prize: Lord Norman Foster, Lord Richard Rogers and Australia’s Glenn Murcutt. 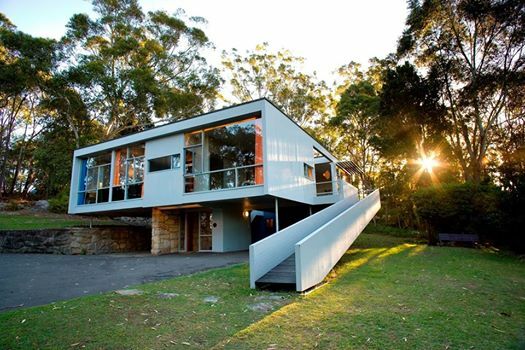 From the age of 16 Harry Seidler was convinced he would be an architect. The few modernist buildings going up in his home town of Vienna, the twisted steel and unadorned concrete of the Hochhaus on Herrengasse (1932) for example, excited the imagination of the young academically gifted boy. But WWII intervened and Harry Seidler was forced to flee Austria along with thousands of other Jews. He found a short-lived refuge in the UK, until he was interned and deported soon after the outbreak of hostilities. It was in Canada that Seidler finally gained acceptance to architectural studies at the University of Manitoba. Although he had not finished his high school education the University admissions board recognised his talent and he was to gain entry at second year level. In this way he finished his architecture degree in 1944 aged 20 and became a registered architect the following year. Arriving in Sydney in 1948, Harry Seidler was intending to stay only a short time, long enough to build a house for his mother, Rose. With that task complete he would return to New York where he had already begun working with one of the doyens of the modernist movement Marcel Breuer. But Harry Seidler liked Sydney and Sydney certainly liked him. Twenty-six houses were designed or built by 1954. He went on to design hundreds of buildings across Australia. NOTE: The film will be followed by a lecture by Vladimir Belogolovsky. Mr. Belogolovsky is the founder of the New York-based Intercontinental Curatorial Project, which focuses on organizing, curating, and designing architectural exhibitions worldwide. Trained as an architect at Cooper Union in New York, he has written over two hundred articles, as well as five books including Harry Seidler: LIFEWORK (Rizzoli, 2014.His exhibition Harry Seidler: Painting Toward Architecture has been travelling around the world since 2012.